Ribblesdale is one of the Yorkshire Dales and is the dale or upper valley of the River Ribble. Ribblesdale from north to south includes the towns and villages of Selside, Horton in Ribblesdale, Stainforth, Langcliffe, Giggleswick, Settle, Long Preston, and Hellifield. Below Hellifield the valley of the river is known as the Ribble Valley. Above Settle the dale is within the Yorkshire Dales National Park and is a popular tourist area, especially with walkers. The Three Peaks that rise to the east and the west of the dale are now known as the Yorkshire Three Peaks to differentiate it from the inception of a number of challenges requiring the achievement of reaching the summits of Ben Nevis in Scotland, Snowden in Wales and Scafell in the Lake District. The Ribble Way runs the length of the dale and the famous Ribblehead Viaduct sits at its head crossed by the Settle to Carlisle railway which also runs through the dale. The River Ribble which flows through the dale and the only river rising in Yorkshire which flows westward, begins at the confluence of Gayle Beck and Cam Beck near Selside between Horton in Ribblesdale and the Ribblehead Viaduct. It flows for 75 miles through Settle, Clitheroe, Ribchester and Preston before entering the Irish Sea between Lytham St. Annes and Southport. Its main tributaries are the Hodder and Calder which join the river near Great Mitton, the River Darwen which joins at Walton-le-Dale and the River Douglas which joins near Hesketh Bank. The River Ribble is also connected to both the Leeds and Liverpool Canal and the Lancaster Canal via the Ribble Link. Horton-in-Ribblesdale is a small village situated on the Settle to Carlisle railway to the west of Pen-y-ghent and is the traditional starting and finishing point for the Three Peaks walk. The village has two pubs The Crown Hotel and The Golden Lion, a village store as well as a cafe and tea rooms. The village post office is now located in the Crown Hotel. On the edge of the village 17th century yeoman’s farmhouses can be found and later cottages can be seen nearer the village centre. in the 1870’s the new railway brought about the building of Victorian terraced housing and later the local quarrying of limestone led to the building of housing for the quarrymen. The area is popular for caving and potholing with Alum Pot and the Long Churn cave system just to the north of the village and on the western side of Pen-y-ghent with Hull Pot and Hunt Pot. The Pennine Way and Ribble Way long distance footpaths pass through the village. The Three Peaks is a collective name for the fells of Pen-y-ghent at 694m (2,277ft), Whernside at 736m (2,415ft) and Ingleborough at 723m (2,372ft). Their limestone interiors are riddled with cave systems, some attractively lit for visitors. The peaks which form part of the Pennine range encircle the heads of the valleys of the River Ribble and of Chapel-le-Dale in the Yorkshire Dales National Park. 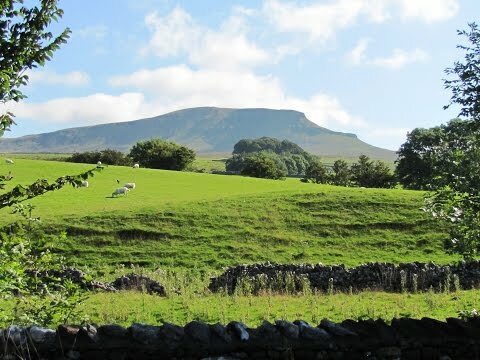 These very popular peaks on the far side of Ribbledale overlooking the Lune Valley into Lancashire can be walked individually or as the “The Three Peaks” challenge walk which is probably the original three peak walk within the UK. The first recorded ascent of the three mountains was in July 1887 by J.R. Wynne-Edwards and D.R. Smith in a time of 10 hours. The Three Peaks challenge walk of 26 miles includes 1,524 metres of ascent and descent to be completed in less than 12 hours. Most people start the challenging walk, usually anti-clockwise, from Horton in Ribblesdale but can be done from various points in the circular route. Chapel-le-Dale was the official starting point of the route before the Pen-y-ghent Cafe in Horton in Ribblesdale started running their clocking in and out service for walkers in 1968. The walkers who register the beginning and end of their walk at the cafe and complete the walk within 12 hours are invited to pay to join the Pen-y-ghent Cafe’s privately owned “Three Peaks of Yorkshire Club”. The route of the walk is also used for a fell race hosted in April and the Three Peaks cyclo-cross race which takes place on the last Sunday in September all of which attracts thousands of visitors, walkers and cyclists each year. Participants in both the running and cycle race regularly achieve winning times of about 3 hours and often both are won by the same competitor. The Yorkshire Dales National Park run a voluntary Friends of the Three Peaks project, the proceeds go towards the upkeep of the paths on the route. Pen-y-ghent the first of the Three Peaks lies 1.8 miles east of Horton in Ribblesdale and the Pennine Way links the summit to the village which is roughly 3 miles in length as the path curves to the north before turning east to reach the summit. The more direct route, via Brackenbottom, that ascends the southern nose of the hill is the route usually taken by those attempting The Yorkshire Three Peaks Challenge. These two routes can be combined to ascend and descend the summit as an individual peak. In the 19th century Pen-y-ghent appeared so dominant that visitors thought it to be the highest mountain in England. Its stepped appearance and flat top are the result of layers of grit stone round which softer rock is eroded. The Pennine Way often referred to as the back bone of England is 268 miles long. The Old Naggs Head in Edale in the Derbyshire Peak District, once the village blacksmiths dating back to 1577, is the official start of the Pennine Way. The National Trail heads north along the Pennine Hills passing through the Yorkshire Dales and the Northumberland National Park ending at Kirk Yetholm just inside the Scottish Border. The Pennine Way, very popular with walkers for many years, has 535 access points where it intersects with other public rights of way and crosses many roads and passes through many villages and towns with good public transport making it easier to be able to do long or short walks. The Pennine Way is not accessible to cyclists or horse riders but the more or less parallel Pennine Bridleway is open to all except motorised vehicles. Ribble Way is a 73 mile long distant walk between the Lancashire coast and the Yorkshire Dales National Park. The official start of the Ribble Way is the Dolphin Inn in Longton near Preston, Lancashire. The route passes through Preston, Ribchester and Clitheroe before reaching Gisburn. The way then crosses from Lancashire into North Yorkshire and continues into the Pennines to its source at Gavel Gap on the remote Cam Fell between Horton in Ribblesdale and Hawes. The Ribble Way passes through a variety of landscapes including tidal marsh, open moorland and limestone gorges. It connects with several other long distance walks including the Dales Way, the Pennine Way, the Pennine Bridleway and the Round Preston walk. From the side of the road we walk forward and take the footbridge on the right just before the road bridge. We pass the public toilets and head across to the car park entrance and turn right. We head forwards passing the Pen-y-ghent Cafe. Just before the church we cross the road turning left at the footpath sign and follow the narrow tarmac path through the field. We go through a gate and head forward between the buildings to the road and turn left sign posted Pen-y-ghent we then head forward and turn right at the next sign post for Pen-y-ghent via Bracken Bottom. We cross over the stream and turn left past the primary school and follow the lane to the first building at Bracken Bottom. At the first building we turn left through the gate and at the second gate we turn left uphill. We now keep heading forwards following the path towards Pen-y-ghent. At the gate and junction of paths we turn left onto the Pennine Way and head steeply uphill following the path to the top. At the top we follow the stone flags slightly uphill to go through a wall. We are soon on the summit of Pen-y-ghent marked by a trig point. We now go over the stile in the wall on the left and head downhill still following the Pennine Way towards the scar in the landscape. Below the scar the path turns left downhill and we keep following it going through two gates. At the cross roads of paths we turn right sign posted Foxup (this is a short detour to Hull Pot) and when the path splits we keep heading forwards to Hull Pot for a look. We then retrace our steps back to the cross roads of paths and head forward through the gate back onto the Pennine Way. We now follow the walled track downhill to Horton in Ribblesdale. At the end of the track we turn right back to our parked car. This is a moderate to hard walk on good footpaths and tracks with some steep ascents and descents. Approx 6.5 miles allow 3 to 4 hours using OS Explorer Map OL2. Yorkshire Dales, Southern and Western areas. Start point: Station Road in Horton-in-Ribblesdale, near the railway station. Horton-in-Ribblesdale is in the Yorkshire Dales. From the A1 take the A684 to Bedale, Leyburn and Hawes. Make your way through the centre of Hawes and when the main road bears right to Sedbergh take the left turn to Ingleton on the B6255. Follow this road until Ribblehead Viaduct is seen on the right and take the left turn to Horton in Ribblesdale. Car park is on the right just over the bridge. Parking: Some free roadside parking and a pay and display car park near the bridge. There are public toilets in the car park. For refreshments there is the Pen-y-ghent Cafe and two pubs the Crown Hotel and the Golden Lion Hotel.